Three years since its inception, T-Hub’s focus now is to find and attract the best startups from across the country and help them scale. What was once the idea of then IT Minister KT Rama Rao, along with a few IIIT professors, became the go-to startup destination not just in Telangana but across India over the past three years. T-Hub, which launched with the premise of ‘walk in with an idea, walk out with a product’, has today evolved from being just an incubator to being a full-fledged scaling platform. Launched in November 2015, the idea of T-hub was to help technology-related startups in India by giving them a working space and access to mentorship, networking opportunities, and workshops. Two years into operations, T-Hub took its first major pivot: From being an idea-stage startup incubator to focusing of startups in the early and growth stage. Even then, what T-Hub mainly did was provide startups, now at the growth stage, with space to work out of, several programs, interventions, networking opportunities and even access to accelerator programs. But there was no structured way in which it offered these services. For most part, being associated with and being in the building was the major value add for startups. But by May 2018, that changed with the launch of Lab 32. T-Hub went from being a co-working space running some programs and interventions to a full-fledged cohort-based incubation program, much like a college university course. It now was focusing on one thing – its incubation program. It did run combined accelerator programs, but Lab 32 was T-Hub’s major focus. What is also significant was that, while T-Hub, a startup in itself, was evolving, what was also evolving rapidly with it was the startup ecosystem of Hyderabad. A city that was once not even on the list, now became one of India’s hottest startup destination, garnering global attention. “When T-Hub started, there wasn’t much going on in the city. We were the centre of everything. Today, Hyderabad is a very different place. There are over 17 incubators in Hyderabad focused on specific industry segments, there are several co-working spaces, there’s a state innovation cell, there is WE Hub for women entrepreneurs, there is T-Works for hardware startups. So, over the years, we have managed to create an ecosystem in Telangana. It’s not just T-Hub anymore,” says Srinivas Kollipara, interim CEO, T-Hub says. As a result, now T-Hub has a sharp focus, which is to find and attract the best startups from across the country and help them scale. And that is what Lab32 does, Srinivas says. And that is already showing results. MyGate, secuirty management system startup, moved to Hyderabad to be a part of Lab32. Most recently, it also raised $8.8 million as part of its Series A funding round. But it is not just Lab32. Srinivas claims that T-Hub also has the country’s best corporate innovation program as well. As part of this program, T-Hub helps startups connect with large programs t work on building solutions for them, or sign them up as clients. Global companies such as Boeing, UTC, HSBC, Qualcomm, have worked with startups from T-Hub as part of various programs. Similarly, T-Hub also has an international market access programs where startups from other countries, get an opportunity to enter the Indian market through T-Hub and vice versa. 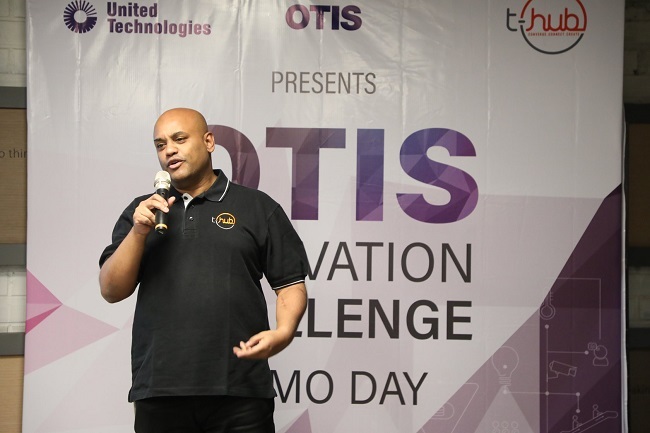 “With startups from different countries and cities coming to Hyderabad, there is a lot of knowledge that is spread among the startups of the city. That’s how Silicon Valley too became what is it – by attracting startups from across the world to move there. Even Bengaluru, in fact. You can only thrive when you have great startups from across the world coming and setting up in your city,” Srinivas adds. And that is what T-Hub is aiming to do. It wants to become the go-to destination in India for any startup in the world to scale. And the destination for startups across the globe to come to, if they want to make it big in India. “If you want to scale, you come to us. You want corporate connects, come to us, you want connects with the government, you come to us. That’s what we want to enable. That’s a big deal and that’s what will make people come here,” Srinivas says. And it’s just been three years, he adds. “It’s only been 4 years since the idea came to my head and 3 since building came up and the amount of growth, we have seen is phenomenal. We have potential unicorns too. But these things, they dont happen overnight, it’s going to take time. T-Hub’s vision has always been to make Hyderabad one of top startup cities and it’s not just what we do, it’s what we enable through everything else,” Srini adds. However, with assembly elections in Telangana around the corner, a question that would come to mind is the future of T-Hub, should the incumbent Telangana Rashtra Samhithi government not come back to power. This is because T-Hub was KTR’s brainchild and whose success KTR and TRS have been very vocal about. But Srinivas is not perturbed. He says that T-Hub is not about the government but purely about the startup ecosystem. “I don’t think it will affect the growth of T-Hub in anyway, not at all. Yes, it was KTR’s idea and yes, he put in a lot of work into it. But everything T-Hub does is about helping startups scale and not about gaining political mileage. We are heads down creating companies and whichever government comes to power next will want to create employment opportunities, which we provide with startups scaling and growing in the city. Don’ think it will matter which government comes to power,” he adds.